Well this is it—the day I start the 300-mile Chinook Trail! I said goodbye to my family and took the Amtrak from Bellingham to Vancouver, WA. The train was delayed, which was a bummer as it would already be difficult to make it to the first camp before dark. Some time was made up en-route, but I still got in about 35 minutes late. Steve Jones from the Chinook Trail Association graciously picked me up at the station and drove me to the trailhead at Lucia Falls Park (thank you, Steve). After a few photos I was on my way. The trail was flat and I was passed by a group of high school cross country runners going the other way—I didn’t know it then, but they were the last people I saw for three days. At the Bells Mountain trailhead I took the obligatory photo of the Chinook Trail crest, and then started uphill. It was a fairly standard Northwest forest trail, but the views started to open once reaching the first clear-cut area. With a 4 p.m. start I knew I’d only have about three hours to make nine miles. The cloudy skies didn’t help—it got dark sooner than I expected. Time to get out the headlamp. By the time it got pitch black I didn’t have far to go, but being my first night hike I was a little spooked by every little sound in the forest. I saw a pair of glowing eyes at one point but soon discovered it was just a deer. I was happy to finally reach Cold Creek camp at about 7:45—it’s accessible by car and being October I had my choice of sites so I picked one by the creek. Had a quick snack, set up the tent, and called it a night. Woke up without an alarm at 7:45—it had rained lightly overnight, but with my tent under a tree it was relatively dry. Had oatmeal and coffee, then packed up and headed out. My goal the previous night was to reach the Rock Creek camp, but it turned out to be about an hour away so it would have been even more night hiking. From here I was on the Tarbell Trail, heading upward toward Silver Star Mountain. The Tarbell Trail is well maintained and passes through alternating forest and forested areas. The views start to open up the higher you go and it was cool to see where I started, which was now about 15 miles away. During this section there were a few trickling streams—I thought there would be others farther on, but there weren’t… more on this later. I was trying to make up time so there were a few sections where I deviated from the Tarbell, taking steeper logging roads instead. In the end it was probably a “six of one, half dozen if the other” kind of situation. As I approached the Silver Star summit there were amazing views in all directions. I only had a few hours of daylight left so unfortunately I skipped the side trail to the actual summit and joined the Bluff Mountain Trail. This trail is amazing, and is now one of my favorites in the state. I don’t think many people do it or know about it, probably because it’s difficult to get to. I love talus traverses and this one was exceptional. 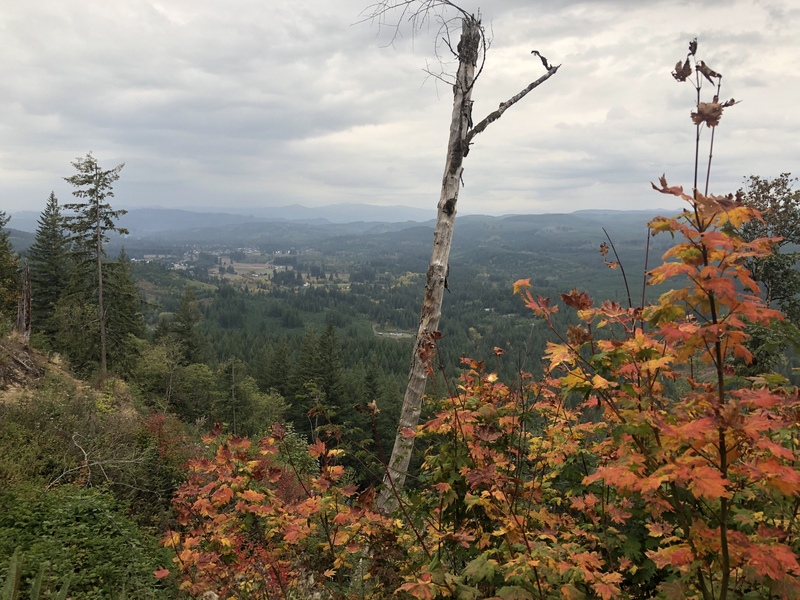 I made it around to the backside of Little Baldy and Bluff Mountain and a whole new view opened up of the Copper Creek valley. The wind was picking up and the sun was starting to set, and there definitely was nowhere to camp here so I picked up the pace. About 15 minutes before I would have got out my headlamp the trail met up with a logging road in a large open area—Bluff Mountain trailhead! I set up camp, caught the last remnants of sunset, and called it a night. Didn’t get the greatest night of sleep, but more on that later. I have owned and operated Double Crown Records, a Bellingham, WA based surf and instrumental rock n' roll label, since the mid-90's, but have always been a hiking enthusiast. Over the last few years I have worked towards doing just about every hike within 20-30 miles of Mt. Baker, and have also made it a goal to do every trail on Chuckanut and Blanchard mountains near Bellingham, WA. 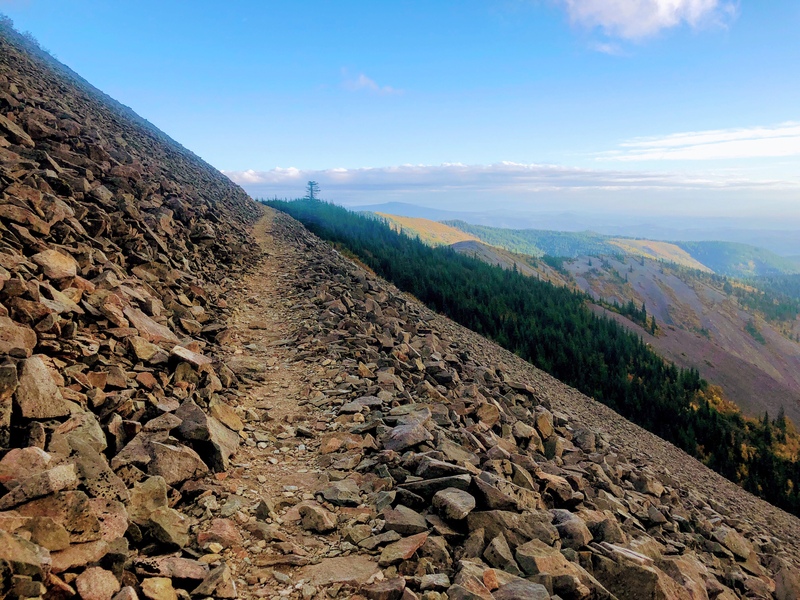 In October 2018 I did a solo thru-hike of the Chinook Trail in Washington and Oregon along the Columbia River.